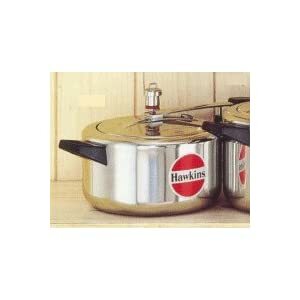 If there is one brand in the pressure cooker space that is well known and widely used, it has to be Hawkins. However, anyone who knows the brand would also know that all Hawkins cookers are the traditional – not so cool – style cookers. While they are reliable, durable and rugged, sometimes they are just not want you want in your kitchen. Hawkins has thought of this long and hard and come out with Futura pressure cookers. The Futura – as the name suggests – is a futuristic looking pressure cooker from Hawkins. While the external appearance has been revamped completely, the major features are still trademark Hawkins. Anyone who has used Hawkins would be pleasantly surprised by the Futura model. It is truly great to look at. The anodised black aluminum cooker looks very classy and suitable to be used in a modern kitchen. If you go to buy a Futura model, you will find that it is steeply priced as compared to a regular Hawkins cooker of similar capacity. So would you pay a huge premium just for good looks? That is not what a smart buyer would do. But then, Futura is not just about great looks. It comes with many safety features which are not available in the traditional design. Now, would you pay for a cooker that is designed to be safer or would you just settle for a cheaper cooker with just a strong company track record as a consolation? If that is not good enough, Futura offers you more. The great looks that attracted you to this model are long lasting. Futura comes with a Satilon finish – this is a Hawkins proprietary technology. This Satilon coating gives the cooker its classy look, at the same time it also protects the cooker from stains, greases, and scratches. Hence your Futura will continue to look as impressive as you first bought it for many years. This Satilon finish does not react with the food which is a huge improvement over regular aluminum cookers. When it comes to cleaning too, Futura is a very easy cooker to handle. The cooker is designed in a manner that makes it very easy for you to scrub and wash. There are no difficult to reach corners which would otherwise give you headaches. The only drawback though is that these range of cookers are anodised aluminum cookers which means that they cannot be washed in dishwasher. Now that would be something that not many people would believe when they read it, however many users who have used this cooker have noted this as one aspect that really stunned them. Hawkins has really transformed pressure cooking with Futura. It does really cook food express fast. Certainly there are some tough foods which would take 15 minutes to over half an hour in certain microwaves which could be cooked in a Future within 10 minutes too. However, what this also means is that if you are used to an old pressure cooker, you would take some time to adapt to Futura too. Fortunately, there is a good chance that your food is overcooked and not undercooked. Though not the best, you can get a hang of it pretty quickly to start reaping the benefits of your new Futura. One of the other features that has been noted by Futura users is the Stay-Cool handle. No matter how long the cooker has been on the stove and cooking, the handle is always cool. So you never have any problems handling the cooker while you are busy in your kitchen. Secondly, the steam release mechanism has a simple plastic button that you need to press. A lid opens that releases the steam away from your face. You can get a Futura in a good range of capacities from 1.5 litres to 9 litres, so depending on your cooking needs you can choose the right Futura pressure cookers for you. In conclusion, Hawkins is a very old and trusted brand in the pressure cooker space. 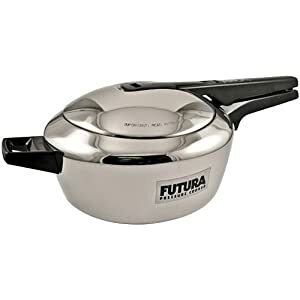 Futura is a new product from this traditional brand that has taken pressure cooking to new levels. Get yourself a Futura and enjoy the benefits of quick and healthy cooking. Amazon has this product from $23 for 1.5 liter, and they having promotion right now, Click here to check current price.